If you're living on the near-Eastside, you've got more meatless restaurant options than pretty much anywhere: Elf, Pure Luck, Vegan Spot, Flore, Cru and a myriad of Thai veggie places. I had been deeply suspicious of the Thai places -- they seem to spring up like weeds in every minimall, and then you never hear of anyone going there. 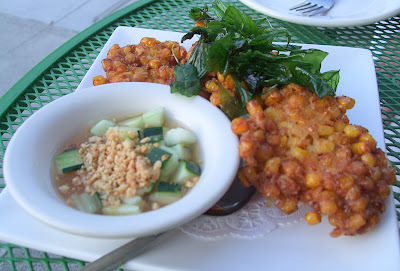 But I had also heard that Bulan Thai on Melrose was a cut above the other Thai veggie places. Then, voila, Bulan opened a new branch on Santa Monica in that funny little pie-shaped spot where Suriyo used to be. Matt thought the faux chicken in the kow soi was a dead ringer for the real thing, but you can get it with tofu if you're scared of fake meat. Bulan is a little pricier than the average Thai joint but the quality of the food seems worth it. I'll definitely be back for my meatless day, or any day when I feel like eating a little "cleaner." 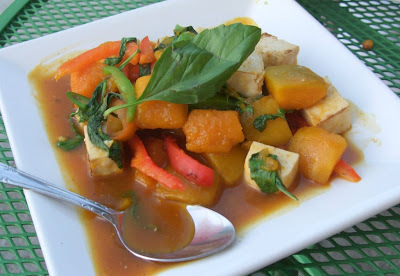 Well you'd hear about people going to these other vegan Thai places if you read my blog ;) Many of which I'll add, are delicious, run by great people and are far from sketchy! Just had my first trip to Bulan (on Melrose) too and will be writing it up soon. By far some of the tastiest Thai food I've had in town, vegetarian or otherwise. 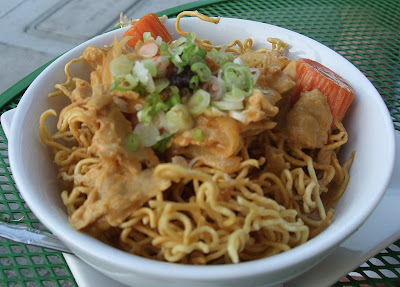 We loved the Kow soi crispy noodles. I really wanted to try the corncakes as well but unfortunately they aren't vegan. I can see why everyone raves about them. Delish! I really do think that Bulan is the best Thai in LA- meat or no meat. Not greasy, but full of flavour. I love their fried banana w/ coconut ice cream to top things off. Yum. i ordered delivery from bulan for the first time the other night. it literally tasted as if they made it in my kitchen...incredibly fresh & delicious. so glad to have finally found an excellent thai place on the east side.